The Puget Sound Ecosystem Monitoring Program’s (PSEMP) Toxics Workgroup has compiled a set of brief summary documents covering recent contaminant research and monitoring in order to provide a more holistic view of the conditions in the Salish Sea and its adjoining watersheds. 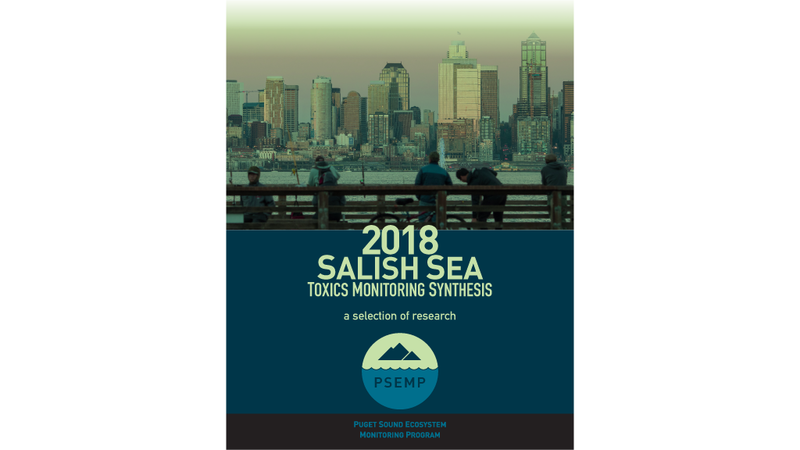 This 2018 Salish Sea Toxics Monitoring Synthesis brings together the contributions of over 50 research and monitoring programs from throughout Washington and British Columbia. It covers activities related to recent conditions, investigations, and management actions aimed at improving our understanding of the occurrence and impacts of toxics contaminants here. We identified several key messages from the suite of contributions to the 2018 Salish Sea Toxics Monitoring Synthesis. These do not cover all the nuance and detail included in the research briefs and the larger study reports and publications represented therein, but they do give a good sense of recent conditions. Chemical contamination continues to be widespread in the Salish Sea; however, there are localized variations in concentrations of key contaminants. Some contaminants impact the health and safe consumption of fish and shellfish, particularly benthic species from urbanized areas, and pelagic fish from throughout Puget Sound. Although Puget Sound nearshore sediments are relatively clean, mussel tissue monitoring shows higher contamination in urban centers. Contaminants in stormwater runoff negatively affect the health of salmon and forage fish species. Contaminants of emerging concern, including pharmaceuticals and personal care products, have been detected at elevated concentrations in Salish Sea waters, with exposed fish exhibiting altered physiology. Current, localized management and cleanup programs are underway and are being adapted according to monitoring results. New ecosystem-scale management plans are being developed to address toxics contaminants in fish and southern resident killer whales. PSEMP Toxics Work Group (2019). 2018 Salish Sea Toxics Monitoring Synthesis: A Selection of Research. C.A. James, R. Jordan, M. Langness, J. Lanksbury, D. Lester, S. O’Neill, K. Song, and C. Sullivan eds. Puget Sound Ecosystem Monitoring Program. Tacoma, WA. 88 pgs. We would like to thank all of the contributors who put time and effort into bringing this document together. The Puget Sound Ecosystem Monitoring Program is a collaboration of state, federal, tribal and local government agencies, non-governmental organizations, watershed groups, business, academic researchers, local integrating organizations, and other private and volunteer groups and organizations - all dedicated to monitoring environmental conditions in Puget Sound. The objective of PSEMP is to create and support a collaborative, inclusive, and transparent approach to regional monitoring and assessment that builds upon and facilitates communication among the many monitoring programs and efforts operating in Puget Sound. PSEMP’s fundamental goal is to assess progress toward the recovery of the health of Puget Sound.